← Can we really teach ‘Indigenizing’ courses online? The typical image of artificial intelligence (AI) & virtual reality (VR) conjured by many is a that of a gamer wearing a headset while immersed in an entertaining environment. However, the latest VR hardware and software delivers powerful learning resources for businesses, non-profit organizations and government agencies. This development gives students the opportunity to learn important lessons in an environment that mimics real-world conditions. The innovation allows students to test their skills, work with leading experts and record their progress in intricate detail, and the results have been exceedingly positive. Nearly 90-percent of teachers who’ve implemented the technology in the classroom report that students are excited to use virtual reality as a learning tool. More importantly, over 80-percent of teachers believe that VR improves students’ ability to learn. These learners will have a marked advantage when entering universities and the workforce, which will increasingly incorporate VR as an effective teaching resource. Virtual reality is also an excellent resource for visual learners and students with disabilities. Remarkably, educators have witnessed heightened engagement and improved test results among all students that have had the opportunity to use the technology. Many learning environments benefit from the powerful capabilities of VR. The following 4 entries review a few of the settings where contemporary students gain an advantage using the technology. Virtual reality can provide an enhanced training environment for nursing professionals, where practitioners can learn as needed and when desired. This fully immersive technology has the potential to improve the quality of care for patients. 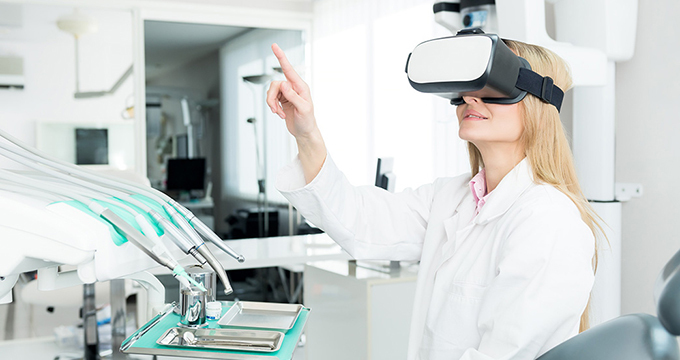 Nurses can use VR training to practice how to respond appropriately to various medical conditions, or learn essential skills, such as how to take vitals and conduct routine tasks. More importantly, the tool provides a learning experience that significantly eclipses on demand video training with more defined imagery, enhanced student engagement and better lesson retention. A growing number of educators are adopting virtual reality as a tool for teaching, and learning. The technology is an exceptional resource for practicing teaching scenarios and allows teachers to virtually respond to behavioral issues so that they are prepared to manage classroom challenges. For students, VR provides a place where large groups, despite their physical location, can interact with each other in a simulated, three-dimensional world. The construct provides a fun and easy way for students to absorb complex lessons and interact with virtual elements that pique their curiosity. Social workers now use virtual reality to learn by interacting with digital clients. The high-tech learners practice how to respond appropriately to different behavioral issues in VR, while learning basic social work skills, such as interviewing patients and parents. Students can also work on more advanced skills, such as behavioral assessments and analyses. In fact, the behavioral health field is an early adopter of virtual reality. The technology is ideal for role playing and learning standard client scenarios. Behavioral health educators also use VR to prepare students for challenges that they might encounter while working in community settings. Virtual reality has transformed and improved the training capabilities of emergency response agencies around the world. Emergency response volunteers and employees can practice in the most demanding environments as much as needed, firmly imprinting best practice disaster procedures into their minds without placing themselves at risk. The technology also facilitates group training, which builds rapport, trust and uniformity among members. Additionally, agencies use VR to practice organization wide responses and conduct collaborative interventions with other emergency services within their municipalities. The ability of the groups to grow more familiar with each other and work together as a team greatly improves the safety of their communities. Virtual reality is an exceptional learning tool for students and educators. The technology improves learning experiences and results in better outcomes for students. By learning in what looks and feels like a real hands-on environment, students can greatly improve their cognitive abilities. In VR environments, students become immediately engaged, experience improved lesson recall and can better express the things that they’ve learned to others. Now, learners can participate in training that was previously nonexistent and prepare for a wider scope of scenarios. The latest iterations of virtual reality provide users with an astoundingly realistic, immersive and interactive digital facsimile of the world and beyond. As an educational tool, these extremely accurate environments make it easier for students to absorb and retain training. Virtual reality delivers the ability for any student with the right equipment and Internet access to learn any topic imaginable, from anywhere in the world. Analysts forecast that the cost of virtual reality equipment will drop sharply in 2018, accelerating the incorporation of the technology into many classrooms across the globe. This positions virtual reality technology to create a sweeping transformation in how students learn and apply their training in the real world.